Rotherham glass manufacturer Beatson Clark has a heritage dating back centuries, so it's appropriate that the company has been chosen to supply bottles to the first monastery to brew beer in the UK since the days of Henry VIII. Monks at Mount Saint Bernard Abbey near Coalville in Leicestershire have become the first in the UK to brew an officially recognised Trappist beer – and their brewery is one of just 12 in the world to earn the name "Trappist." Beatson Clark is supplying 330ml amber beer bottles from its general sale range to the brewery, along with green crown closures which feature the brewery's logo printed in white. 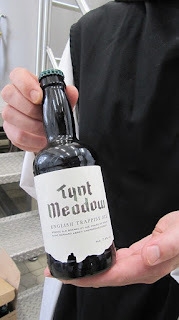 The beer is called Tynt Meadow and is named after the meadow where the monks originally settled in 1835 and is on sale at the abbey and in specialist beer shops. The monks started planning their new brewery in 2013 after they closed down their economically unviable dairy farm. Beer brewed by monks was common in England in the Middle Ages but the practice died out after the dissolution of the monasteries during the Reformation by Henry VIII. Trappist beers must be brewed within the abbey by the monks or under their supervision, and brewing must be secondary in importance to the monastery's work and way of life. A Trappist brewery must not make profits, but rather the proceeds should go towards the monks' living expenses and grounds and to help charitable causes. Jonathan Clark, Account Manager at Beatson Clark, said: "This is a historic and very exciting development for lovers of traditional beer and Beatson Clark was really pleased to have been asked to supply the bottles for this new beer. "We recommended the amber glass beer bottle from our standard range because of its traditional appearance and because amber glass protects the beer inside the bottle from the harmful effects of UV light." Father Erik Varden, Abbot of Mount Saint Bernard, added: "We chose Beatson Clark because they were able to provide the shape of bottle we wanted. Our dealings with the company have been very happy so far; we have found their service very good and their communication prompt, courteous, and effective."